The Corporate America brainstorm is a watered down clone of what it once was. But it can be saved. We don’t teach people to be creative. We teach art. We teach creative writing. We even teach business leaders how to “cultivate innovation”. But we do not teach people how to be creative. And the crutch most people use to prop up their need for new ideas is the iconic brainstorm meeting. Or worse yet, they assign 30 minutes to brainstorm as an agenda item within another meeting. You’ve probably been in more than one brainstorm that sucked. Many great businesses start off with one great idea. One great spark of genius. And then in the name of efficiency, begin to kill off creativity one cost savings and quality assurance meeting at a time. Turning out a quality product is aided by boring, repeatable, uncreative work. These are the facts of the corporate slog. And yet, we all recognize the power of that spark. The power of the story. Of marketing. The power of that one great idea. And the real competitive advantage of a company that can consistently churn our those great ideas over and over again. See Apple, Google, Lockheed Martin, GE. Here is a common scene. The boss steps up to the head of the conference table, next to a whiteboard, with a table full of his or her subordinates. His or her assistant brought snacks and mans the whiteboard, ready to scribe a bunch of awesome new ideas down for the record. Let the great sins of creative lusting be laid bare for all to see. A creative company culture is powerful. And there is nothing wrong with trying to be more creative. But creativity cannot and will never be built into a company in a single meeting, as we so often demand. Creativity requires real work. Real time. And real effort. And it requires, wait for it… a plan. 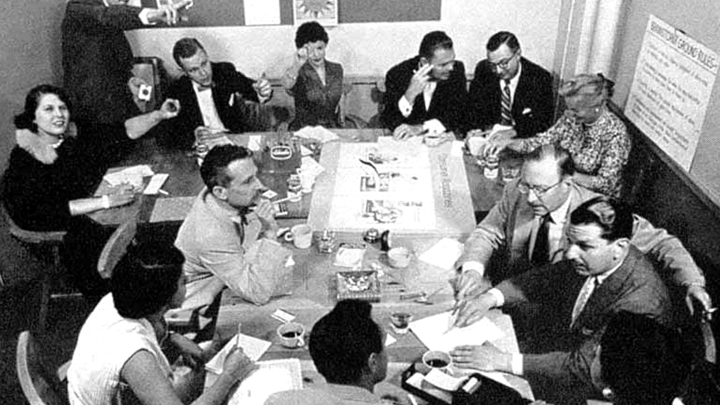 The original brainstorm meetings were a product of BBDO, an NYC ad agency, back in the 1940s. It was one of many techniques they used to generate new ideas for their clients. And they were really good at it. But it was not a cure all. And it included a few important features that MOST folks do not incorporate into their brainstorm meetings today. The first of these forgotten features is a well formed plan. Several key elements exist in this plan. Define The Problem — Every brainstorm should seek solutions to a problem. Define, on paper, the scope of the problem being attacked. Give Background — Ensure your team has a clear understanding of how things got to this point. Where the problem came from, past attempts to solve it, client details, timelines, etc. Define A Goal—Define what the final solution will accomplish as well as how many initial ideas are sought (50 is a good minimum). Give Examples—Give at least three examples of the types of solutions being sought. Detail Instructions — Write up and print out a one-page brainstorm plan that includes your problem, background, goal, examples, and team. Include the step-by-step process of your brainstorm sessions and any rules to play by. This simple planning doc should be sent to your team well in advance of any physical brainstorm meeting. Too often we give too little info with too little notice and expect big ideas from uninformed and unprepared teams. Put in the planning and in return your team will deliver you with better, more informed solutions to the problem you seek to solve. The cardinal rule of brainstorms, surviving from the days of BBDO, is “no judgement.” Early in the creative process negative feedback kills any potential for great ideas. It silences individuals. It reduces the volume of ideas. Which reduces the opportunity for happy collisions. It is a great rule. And many brainstorm meetings produce a modicum of good ideas because of it. But, it does not eliminate all of the negative pressures that a team meeting creates. The complex social dynamics of our human nature is incredibly difficult to overcome. So instead, let’s just preempt it. Before the actual meeting portion of your brainstorm meeting, assign each member of your team the task of coming up with 10, 20, or 30 solutions to the problem at hand. Give them the planning doc that you spent so much time creating and let them loose. On their own. Alone. In whatever setting they choose. With your team working on their own to kick off the creative process, you will see several benefits. Potential negative impacts from an in-person group dynamic will be minimized. Time will be saved in the meeting itself and the group can focus on augmenting, combining, and improving the best ideas collectively. The sources of inspiration for each team member’s ideas will vary greatly. Some will work from home, some on the plane, some at their child’s soccer game. Unique environments help create a more diverse set of ideas. More obvious (aka bad) ideas will be produced. More absurd (aka big) ideas will be produced. The boss, and any unintentional bias he or she may produce, will not inhibit the beginning of your creative process. Once you have the list of ideas from every team member, combine it into one list, remove duplicates, organize them under similar topics and then redistribute back out to the team before your meeting. A key step here is to anonymize the ideas before redistributing them. This emphasizes the quality of the ideas and removes personal biases toward who came up with the idea. Each of these steps creates more work for whoever owns the brainstorm meeting and allows the brainstorm team members to more efficiently contribute their best ideas to the effort. That is how every meeting should work. Whoever calls a meeting should not be looking to pass along the burden of their workload, but rather, they should work hard to make it easier for a team to contribute in constructive ways. Having to work this hard in order to host a brainstorm meeting will likely mean fewer brainstorm meetings as well. You’re welcome. These two simple processes will make your meetings more organized and produce better ideas more often. Jason Keath is a refreshing voice on creative culture and digital trends. He is a keynote speaker, writer, and entrepreneur. Click here to book Jason to speak.